The Greenwich Peninsula is an area that has undergone repeated change over the past 500 years, and yet remains one of the least known parts of London. Though many Londoners know well the Blackwall Tunnel Approach Road, and hundreds of thousands of visitors go between North Greenwich Station and The O2, few walk the area between the south and north of the peninsula, with its mixture of luxury apartments, Victorian terraces, thriving chemical factories, retail parks, shadows of London’s industrial past, and unexpected open spaces. Like so many better known parts, the peninsula has acted as a stage on which the roles of London have been performed. The drama can be read in a number of ways: as land use – marshy wilderness, agricultural, industrial, cheap housing, dock services; as the products of and for the city at the centre of empire - soap, cement, sugar, chemicals, linoleum, ammunition, cabling, gas, boats, tar, paint, benzene; in the occupations of its inhabitants – market-gardeners, scavengers, industrialists, laundresses, shopkeepers, lightermen, munitions workers; and in how their lives were recorded – in census, parish and workhouse records, in maps of tithes, bomb damage or relative social status, in newspapers and the writings of Mayhew, Dickens, Gissing and others. Looking at the history and the present of the place, famously described by Iain Sinclair as “where the nightstuff was handled”, there is no sense of a “coherent proper state” or any form in which the place has achieved its most appropriate condition. How then do we invent an identity for the area? Births, Chimneys and Lightermen – Collecting Greenwich Peninsula has been commissioned as an installation for the Story Wall between North Greenwich Station and The O2, which explores how we negotiate a sense of place. 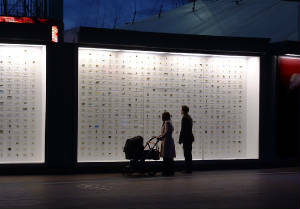 Using research findings which include aspects of demographics, geology, archaeology and natural history, the work is a vast grid collection of artefacts, objects, printed and drawn fragments and information, in which connections between object and text may be authentic, viable, fictional, imagined or arbitrary. The work invites viewers to create their own stories, which allow for continuous reinvention. In Doreen Massey’s words, “the throwntogetherness of place demands negotiation ... places as presented here in a sense necessitate invention; they pose a challenge. They implicate us ... in the lives of human others, and in our relations with nonhumans they ask how we shall respond to our temporary meeting-up with these particular rocks and stones and trees. They require that, in one way or another, we confront the challenge of the negotiation of multiplicity.”*; the work acts as a catalyst for that negotiation. This work will continue Walker’s collection-based installations shown over the past 12 years in the UK and abroad, many of which have involved local residents. His work can currently be seen at the Wellcome Collection and at Norwich Castle Museum. What happens as the installation changes? Births, Chimneys and Lightermen was intended, and constructed, as an installation to last two months. However, the public response has been such that it has been requested that the work should stay up for a total of five months. This has meant that the work is now being affected by sunshine more than was intended; some of the printed items have begun to fade, some of the botanical specimens have dried and become brittle to the point of crumbling, and at least one item, labelled "noxious matter", which was hard when installed, has begun to melt. All this is in keeping with the concept of change which the work deals with. It was intended that some of the items, when the installation came down, would be returned to the sites where they were collected - the edge of the road, the foreshore, various spots of wasteground. Instead, as the colours fade and return to the light of the sunshine, they seem to be making their way to their own destination, a journey that I have no control over, and which I can only observe, not without some satisfaction.